Midnight Sun Mining Provides Corporate Update – Midnight Sun Mining Corp.
Vancouver, British Columbia, January 31, 2018 – Midnight Sun Mining Corp. (the “Company” or “Midnight Sun”) (TSX-V: MMA) provides a corporate update and announces its exploration plans for 2018. Midnight Sun has satisfied all of its obligations under the Option Agreement with Kam Chuen Resource Holdings Ltd. (“Kam Chuen”) and has earned a 60% interest in the Solwezi Group of Exploration Licences (the “Licences”) (See November 29, 2013 news release titled “Midnight Sun Signs Definitive Option Agreement for Exploration Permits in Zambia”). 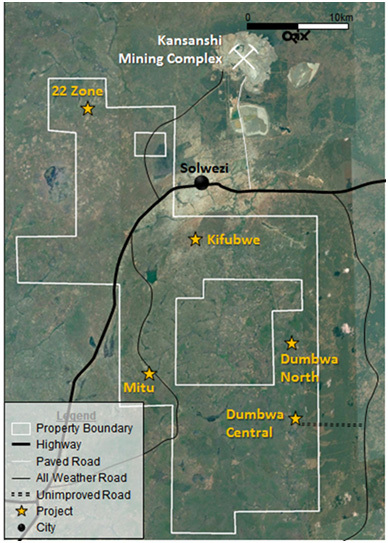 The Licences consist of two individual exploration licences, 21509-HQ-LEL (formerly 14039-HQ-LPL) and 12124-HQ-LEL (as shown below in Illustration 1.0 – Solwezi Group of Licences), covering over 506 km2 of surface area. The Licences are located in northern Zambia, adjacent to Africa’s largest copper producer, the Kansanshi Mine, on the prolific Zambia-Congo Copper Belt. Having satisfied all obligations under the option agreement, the Company is now in the process of formalising a shareholders and governance agreement with Kam Chuen to govern the further exploration and operation of the Licenses as a joint venture. The Company is planning a comprehensive exploration program for 2018, beginning in April, immediately after the rainy season in northern Zambia. Initially, Midnight Sun will conduct an airborne geophysical survey [Heli-borne Versatile Time Domain Electromagnetic (“VTEM”)] over the three main targets: Mitu, 22 Zone and Dumbwa (north and central), and the additional prospective targets of Khaziba and Kifubwe. Once completed, the Company will prepare a comparative interpretation utilizing the new data from the VTEM survey and the known drill data from its 2016 and 2017 drilling campaign to determine primary and secondary drill targets on the 3 main mineralized areas, with a principle focus on Mitu. The focus of the 2016 and 2017 exploration programs and drill campaigns was to expand and further define the extent of the previously announced ore-shale type copper-cobalt discovery at the Mitu area of the Solwezi Licences. These programs included drill hole MDD-17-15 which stepped out 3.72 kilometres (“km”) southeast from discovery hole MDD-16-01, and reported 3.44% copper, 0.067% cobalt, 0.058% nickel and 331 parts per billion gold (4.23% copper equivalent) over 11.6 meters (see news releases dated January 12, 2017; February 10, 2017; May 3, 2017; and July 4, 2017). A secondary focus of the 2016 and 2017 joint campaign was to understand the mineralization and lithology of the two other regional targets on the Licenses, identified as 22 Zone and Dumbwa (north and central). Please refer to the Company’s previous New Releases as well as the Company presentation on its website at: www.midnightsunmining.com. During January 2018, the Company received gross proceeds of $635,800 upon the exercise of 3,179,000 share purchase warrants priced at $0.20. The share purchase warrants were issued as part of a unit financing, which was announced on October 26, 2015 and had its final close on January 29, 2016. Midnight Sun has granted stock options to purchase an aggregate of 2,575,000 common shares of the Company, at an exercise price of $0.36 per share, to certain employees, consultants and directors. The stock options are granted pursuant to Midnight Sun’s 10% rolling stock option plan, are subject to vesting provisions, and shall expire 5 years from the date of grant. NEITHER THE TSX VENTURE EXCHANGE NOR ITS REGULATION SERVICES PROVIDER (AS THAT TERM IS DEFINED IN THE POLICIES OF THE TSX VENTURE EXCHANGE) ACCEPTS RESPONSIBILITY FOR THE ADEQUACY OR ACCURACY OF THIS NEW RELEASE. This news release includes certain statements that may be deemed as “forward-looking statements”. All statements in this release, other than statements of historical facts, the expected completion of any Offering, and the expected use of proceeds are forward-looking statements. Although the Company believes the expectations expressed in such forward-looking statements are based on reasonable assumptions, such statements are not guarantees of future performance and actual results or developments may differ materially from those in forward-looking statements. Factors that could cause actual results to differ materially from those in the forward-looking statements include: changes in market conditions, unsuccessful exploration results, changes in the price of commodities (particularly copper, cobalt, gold and nickel), unanticipated changes in key management personnel and general social, economic or geo-political conditions. Mining exploration and development is an inherently risky business. Accordingly the actual events may differ materially from those projected in the forward-looking statements. This list is not exhaustive of the factors that may affect any of the Company’s forward-looking statements. These and other factors should be considered carefully and readers should not place undue reliance on the Company’s forward-looking statements. The Company does not undertake to update any forward–looking statement that may be from time to time by the Company or on its behalf, except in accordance with applicable securities laws.